Game-changing ideas from the automobile to the iPhone came about because someone had the vision and ambition to build them. We are all designed to build something, and we express that inspiration through the hobbies and passions we pursue. "BP10 is a perfect tool for creating this awareness, whether it's with entrepreneurs, intrepreneurs or solopreneurs." "It changes your perspective on life. Even if you aren't good at business, it makes you realize what you are good at." "Education is changing. How we educate young people today has to be different than what we were doing in the past … In the future to prepare these young people to be builders, we need to find innovative ways to do that." "One thing that I would recommend for anybody trying to build a successful partnership is to take this test." "You can't build something without thinking about the talent that you have and the talent around you ... Having a well-rounded team with different kinds of leaders is essential to building a great organization." 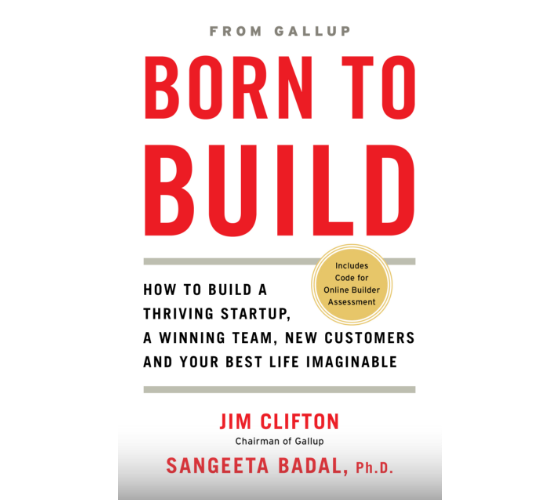 "Focusing on a person's talent so early in the creation of a company is essential … At the end of the day, business is all about people." "It's been fun for us to see them (students) identify the fact that 'Yes, I am a builder' and walk around now and say, 'I can do this because I am a builder.'" "I am excited to build more collaborative communities. I think there is a lot of strength and diversity and inclusion in being intentional about it and not just seeing it from a racial and ethnic perspective." "I believe economic development needs to change in a way that focuses on building companies and building opportunities across our country." Questions? Let Us Know How We Can Help You. 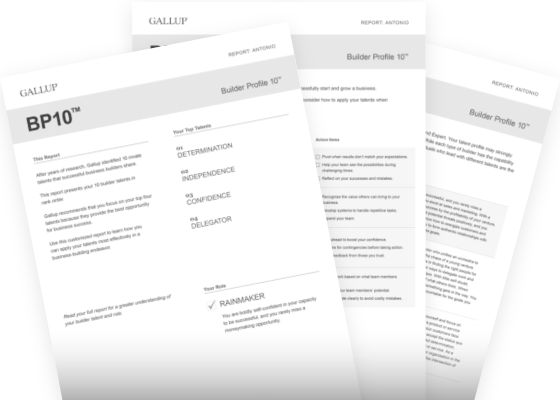 To learn more about how we can help you transform your organization, fill out the form below, and a Gallup representative will contact you.